Northern Rail is expecting to run only a third of normal services on Saturday as staff from the Rail Maritime and Transport Workers Union (RMT) stage a 24 hour walkout. Guards at Northern are striking over the introduction of driver only operation, which would remove some aspects of their role. The union insists staff and passenger safety will be compromised as a result of the change, which is written into the firm’s franchise agreement with the Department for Transport. Northern has written to passengers to tell them only 32 per cent of normal Saturday services will operate. From Blackpool hourly services will run to Manchester Airport and to Blackburn. No trains will run on the South Fylde line. There are no direct services from Blackpool or Preston to Liverpool, where severe disruption is expected on Grand National day. Limited connections will be available from Wigan and St Helen’s. Northern originally said it would operate the last service from Liverpool at 6.30pm. The firm has warned services will be extremely busy. In a letter to customers Northern, which is operated by Arriva, a subsidiary of the German state railway Deutsche Bahn, apologised for the potential disruption. 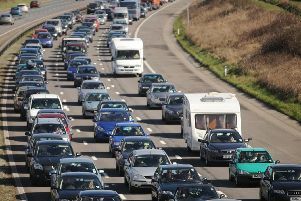 The firm said: "Due to planned industrial action taking place on Saturday April 8, Northern services will be affected. "This action comes as we start our journey to modernise your railway by 2020. "Our modernisation plans include significant investment in new trains, new services and more seats. "We have to make changes on this journey to modernisation and we want to involve everyone as we develop our plans, from our customers and communities, to employees and their trade unions. "As part of our initial work to modernise, we are prepared to offer guarantees on jobs and pay for our conductors. "Despite this offer, the RMT trade union has asked our conductors to strike for the second time on Saturday April 8. "Our priority is to keep you informed, updated and on the move, and we are working hard to make this happen. We expect to run 822 trains, more than 32 per cent of normal services. "Please be aware that any services we are able to run will be extremely busy. Give yourself extra time to travel and consider whether your journey is necessary. "We apologise for any inconvenience this action may cause." Transpennine Express and Virgin Trains services will not be affected. Northern bosses have urged passengers to use other operators' services where possible. Richard Allan, Deputy Managing Director at Northern, said: “We have been working hard to do more for customers and have added six extra trains to help racegoers get home after the Grand National. RMT members at Merseyrail will also strike on Saturday.